We’re excited to announce the release of the new ThemeRoller for Mobile tool. ThemeRoller is a web-based tool that makes it super simple to create custom themes without writing a single line of CSS. If you’re familiar with the jQuery UI ThemeRoller, the basics of the tool are pretty similar: there’s a inspector panel on the left of the screen that has all the theme settings, and a preview pane on the right that shows you in real-time each change you make. But there are some big improvements in the new mobile version which we’ll cover below. Once you create your masterpiece, you can share it via URL or download a ZIP file with your custom theme stylesheet, ready for production (or additional tweaking). This is so beta, we’re not even going to add the flag. Have fun playing and please flag issues in the tracker so we can improve the tool. The Mobile theme framework and ThemeRoller Mobile allow you to create up to 26 unique color “swatches” within a single theme (the UI version essentially has a single swatch). Each swatch defines the look and feel for a bar, content block and a button with normal, hover and pressed interaction states. Within your site or app, you assign swatch letters to individual elements on a page to mix and match swatch colors for really rich designs. Swatches are assigned a single letter from a-z which allows people to share themes easily (unlike unique class names) and flexibly combine swatches on a page. For example, you can assign swatch A to one button and swatch K to another button to make a visual distinction between them. In addition to creating sets of swatches, there are powerful global configuration options to quickly set the font family, active (on) state color, corner radii for groupings and buttons, icon and shadow styles in one centralized place. In the left hand inspector panel, there is a slick tool to create the CSS-based gradients we use throughout the themes. In simple mode you can pick a single color, then drag a slider to choose how deep of a convex or concave gradient you want, or leave the slider in the middle position for a flat appearance. Click the “+” icon to expand into advanced mode and customize the gradient colors individually for both points. Above the preview panel, there are two cool tools that make it even easier to build a theme: the preview inspector tool and the QuickSwatch Bar. First, when the preview inspector toggle is on, it allows you to simply click on an element in the preview panel and have the relevant section of the lefthand inspector panel open for editing so there’s no need to hunt around for the right settings. An even more exciting feature is the QuickSwatch bar. This has a preset spectrum of colors that can be dragged and dropped directly onto an element in the preview pane to re-color it. The lightness and saturation sliders make it easy to shift the color spectrum around to find the right colors. To the right of the spectrum, we display the last few colors you’ve used for quick re-use. These colors can also be dragged and dropped into the color picker wells in the lefthand inspector panel for even more power. A lot of magic is at work here: by dropping a single color onto an element, the tool with automatically calculate the two related gradient colors, border color, and text colors for good contrast (you can fine-tune these in the left panel). By dropping a color on a button/listview, the tool calculates all these colors for the default, hover and pressed states of a button automatically which is a huge timesaver. You can spend your time trying color combinations, not tweaking a million settings. Picking a color palette that works well together is tricky business but we’ve made it easy by adding pre-made themes created on Adobe’s fantastic Kuler app right into ThemeRoller. Kuler is a great site focused on letting people create, share and rate color palettes. If you’re looking for inspiration, simply click on the Kuler link in the QuickSwatch palette and you can browse the latest, most popular or highest rated color combinations from Kuler, or search by tag, title or color. From there, just drag and drop the colors onto widgets in the preview pane to quickly create a great-looking theme in a snap. The jQuery UI ThemeRoller tool used URLs to track every step in your creation history and also make it easy to share and load themes by sending those URLs around. We think sharing themes is important to get feedback and allows others to play with your creations but the sheer complexity of the Mobile themes couldn’t be represented in a URL. Our solution is to store the theme on our server and create a unique URL that allows you to post a theme link and allows other to edit or download a copy of the theme (yours won’t be touched). For example, check out this theme I created. Note: To keep our server from getting stuffed with themes, we’re only going to store theme links for 30 days so you’ll need to download a copy for the long term. Once you have created your final theme, simply click the Download Theme link at the top of the inspector panel to generate a zip file that contains both the compressed (production-ready) and uncompressed (editable) theme files and a simple test page (index.html) to show that everything worked (whew) and instructions on how to add the theme to your site. It’s pretty simple: link your custom theme in the head of the page followed by the jQuery Mobile structure theme and you’re ready to go. To import a theme, just click the Import link and paste the entire contents of the uncompressed theme file into the text input in the dialog, and the system will parse the theme into an editable format for sharing and downloading. This tool came to be through the continued generosity of our sponsor Adobe who dedicated the development time of Tyler Benziger to work exclusively on ThemeRoller for the last 6+ months. Tyler did a fantastic job taking a handful of designs and creating a rock solid tool with lots of creative ideas that exceeded all our expectations. The jQuery Mobile team is thrilled to announce the second release candidate for version 1.0. This new release brings dozens of bug fixes, plus a range of design refinements and optimizations. We plan on this being the last RC before moving to the final 1.0 release within the next few weeks. This plan may change if we run into any major issues that will require broader testing and another RC. To make it easy for developers to add markup that should only be seen by assistive technologoes like screen readers, the new .ui-hidden-accessible class can be added to any element to hide it on-screen, but still available for screen readers (and search engines). We added this because we see developers omitting the label on form elements because they may not want a text label visible on-screen. Not only will the framework have issues when a label isn’t properly associated for a form element, but makes the form much harder (or impossible) to use with a screen reader. So always add a label and correctly associate it to an form element by referencing it’s ID, then tack on the .ui-hidden-accessible class if you need to. If you’re using a field container and choose to hide the label, we’ve created a second class ui-hide-label that can be added to the container which will both hide the label and let the form element take up the full width so there isn’t a blank spot where the label should be. More info in the form documentation. By setting a maximim width, dialogs now look better on tablet and larger screen sizes. Previously, dialogs were 100% width which is perfect for smartphone, but looked odd on larger screens and resulted in very long line lengths for text which is harder to read. Now dialogs and full-screen custom selects have a max-width set at around 600 pixels so the dialog will now center itself over the background and a percentage top margin moves the dialog down a bit to make it look like a traditional modal window on larger screens. At narrower, smartphone-sized devices, dialogs use the full screen width so this only affects large screens. We’ve documented how to override the width as needed if you want to tweak this to your needs. We’re still making fixes, but we’ve addressed a few key bugs with the fixed toolbars in RC2. Widgets that caused the page height to shift like collapsibles and listview filters were causing fixed footers to become incorrectly positioned. To remedy this, we’ve introduced a new updatelayout event that any widget (like collapsibles) can use to tell other widgets (like fixed footers) that they have changed in layout so they can react accordingly. The advantage of this event is that developers can use this same, consistent mechanism when they update the page with dynamic markup or build 3rd party widgets. We’ve also added better documentation on working with fixed toolbars. This is a more of a bug fix, but is worth noting if you ran into this in earlier releases. We previously had a CSS issue that caused a standard form element to inherit some of the field container rules so they were only 60% which was hard to work with. Now, every form element will simply behave as a block-level, 100% width element so you can reliably control the width. We’ve updated all the form docs pages to show an example of each form element by itself so you can see how this will look. Native touch overflow enhancements: Off by default. Since iOS5 has just reached general release, we wanted to get more testing and feedback on the performance of the new touch overflow enhancements for improved transitions and true fixed toolbars before turning this on by default. To activate this feature, set the touchOverflowEnabled global configuration option to true. One important thing to note is that we’ve had to apply a 2D transform to force iOS5 into rendering all the content on a page reliably, but this style rule also sets every element to position:relative which can cause layout issues if you don’t test thoroughly. Demo here and feel free to report bugs in the GitHub issue tracker. Once we feel like this feature (and iOS5) is really solid, we may consider turning this on by default. Refreshing a page with #&ui-state=dialog causes syntax error (issue 2570)- Fixed regression from an earlier fix to loadPage() for detecting un-enhanced pages by @id as a fallback. In this particular case dataUrl was being used to create an id selector, and of course if the dataUrl is an empty string we end up using “#” as the selector. The fix is to simply check for a non-empty dataUrl. Refreshing a page with #&ui-state=dialog causes page duplication (issue 2582) – Modified loadPage() to call isFirstPage() with fileUrl instead of absUrl. Since fileUrl is the same as absUrl, but with the dialogHashKey stripped off, it will allow us to match against the url for the first-page. Restored orientation-based rules – These are useful in certain scenarios, such as when js is setting heights in iOS5. Fixed a bug in the hashchange handler for the pushstate/replacestate plugin that was incorrectly resolving hashchanges for ids against the current location.href, which could be a different document. We now resolve id hashes against the document URL. Firefox 7.0.1 – Collapsible heading gets truncated at the beginning of string (issue #2653) – Fixed by tweaking positioning. Thanks MauriceG! Re-vamped the navbar docs to fix incorrect info about icon positioning and theming. (issue 1858, 1797, 2667, 1180, 2373) – The docs incorrectly stated that the icon position could be set perlink, but this is intended as a global setting for the navbar parent.This is working as designed and helps with visual consistency. If icon positioning needs to be be adjusted per link, you will need to manually apply the right classes through JS and may need to tweak CSS because top/bottom and left/right positions have different heights. List search with dividers breaks fixed footer (issue 2348) – Fixed header/footer code now listens for a custom event contentmodified on the document to figure out if it should be repositioned or not. Modified collapsible and listview to fire off contentmodified whenever they modify content. Developers can also fire off this event to trigger position updates for fixed headers/footers, so this could be used to address issue #2042 and the mention of collapsible in #2596. Refined styles so titles in footer aren’t truncated as aggressively (issue 2706) – Titles in headers and footers had the same padding value in the CSS,but we don’t support the same markup conventions for left/right buttonslot in the footer so this was truncating too early. Fixed dialog reverse transition logic (issue 2699) – Moved the settings.transition calculation code before the code that pushes a new history item on the stack. This ensures that the proper transition is stored with the history item. Added a new .ui-hidden-accessible class for hiding elements in an accessible way; also added ui-hide-label class to similarly hide labels/adjust layout within field containers. Properly apply “disabled” styling and logic to flip switches, sliders, and custom selects (issue 2541) – based on disabled attribute in underlying input markup. Disable cursor events on all disabled custom form inputs by adding the pointer-events: none; rule which works in many modern browsers. Buttons don’t inherit page-theme (issue 2659) – Insert the fake button container before calling buttonMarkup(). This allows the buttonMarkup() code to accurately calculate theme inheritance. Added support for new HTML5 date and time input types (issue 2144) – Types added: input type time, date, month, week, date time, datetime-local to auto for enhancements. Also added support for type=color. Buttons now properly support the data-shadow, data-corners and data-iconshadow attributes. Thanks matthewleon! CSS Restructure for separation of structure and theme (issue 2700) – Created a /css/ folder and a /structure/ and /theme/ folder inside for better organization. Thanks eddiemonge! Theme inheritance optimizations – Removed all of the redundant code used to crawl the DOM upward looking for a theme to inherit from, and replaced it with a call to the new $.mobile.getInheritedTheme() function.Also, fixed a bug in textinput.js that was placing a ui-body-null class on the input element when a data-theme was not specified directly on the input. Custom selects now behave as expected within vertical/horizontal controlgroups (issue 518) – Docs have been updated accordingly. Thanks Wilto! Dialogs now have a max-width of ~600px (issue 2729) – This makes dialogs look better on tablet and larger sizes previously these were 100% width which looked odd on large screens and made text hard to read. Also applies to full-screen selects. Added new custom event called updatelayout that is used by widgets like collapsible and listview filters to tell other widgets like fixed toolbars that they need to re-calculate their position because the layout has changes. Added a new Layout Events section in the events documentation. Note these are the same notes from RC1, just repeating for those that skipped that release. In preparation for jQuery Mobile 1.0 final, we’re removed a number of items that we deprecated earlier in beta. Please note that if you are running on an alpha or early beta codebase, many of these could be breaking changes. Deprecated Media Helper classes have been removed from the build and the docs. The page is still in the docs for Google’s sake and the code can be found in the repo if you want to make a custom build that includes these features. Deprecated re-named page events – the deprecated beforechangepage (now pagebeforechange), changepage (now pagechange), and changepagefailed (now pagechangefailed) events references have been dropped in preparation for the 1.0 release. See the events API documentation and commit log for more info. Removed support for the alpha signature of $.mobile.changePage() in preparation for 1.0. Folks now how to use the signature that requires the toPage (url or element) as the first arg, and options object as the 2nd. See the events API documentation and commit log for more info. Removed deprecated navigation related properties: $.mobile.updateHash$.mobile.urlstack. See commit log for details. Removed the deprecated $.fixedToolbars property in preparation for 1.0. See commit log for details. Removed $.mobile.pageLoading() call which was replaced by $.mobile.showPageLoadingMsg()and $.mobile.hidePageLoadingMsg(). See commit log for details. We’re excited to announce that as of 1.0 RC2, we’ve covered all our target platforms for the project. At this stage, we have broad support for the vast majority of all modern desktop, smartphone, tablet, and e-reader platforms. In addition, feature phones and older browsers are supported because of our progressive enhancement approach. We’re very proud of our commitment to universal accessibility through our broad support for all popular platforms. The visual fidelity of the experience is highly dependent on CSS rendering capabilities of the device and platform so not all A grade experience will be pixel-perfect but that’s the nature of the web. 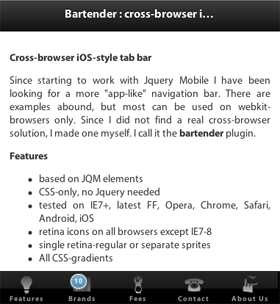 jQuery Mobile 1.0 RC1 Released! The jQuery Mobile team is thrilled to announce the first release candidate for version 1.0. This new release brings a long list of bug fixes, refinements and optimizations, as well as support for the Meego platform. Our plan is release additional RCs at a quick pace as we close critical bugs and move towards the 1.0 release. We’re targeting a 1.0 release within the next few weeks. We just made a few final tweaks to the collapsible and accordion widget that really improves the visual design. First off, we’ve removed the extra button style around the +/1 icons which made this look too much like a separate interactive element (it’s not, the whole bar is clickable) and cleans up the visual appearance. We also added the option to add theme swatch to the expanded collapsible content by adding a data-content-theme attribute to the collapsible container. When this is added, the rounded corners on the header square off and the bottom of the content container is rounded instead to give this a cohesive appearance. You can apply any of your theme’s body swatch letters and the flat background color (not the gradient) and border will be applied. This feature works in both individual collapsibles and collapsible sets (accordions). If this attribute isn’t added, the collapsible look the way they did previously so there is no impact to existing sites. The new iOS5 page transitions and true fixed headers have been improved significantly since Beta 3 but after much debate, we’ve decided to have this feature off by default for now because we want to wait for the final version of iOS5 to arrive so we can test this thoroughly. Note that we’re now using a 3D transform CSS rule reduce page rendering artifacts which could cause memory use issues on very complex pages so you may need to override this selectively. To mitigate some usability issues with overflow containers and fixed headers, we’re also disabling zoom by injecting a meta viewport tag only for iOS5 if this feature is enabled. We’re hoping this won’t be necessary long-term but this is the short-term fix. The small search icon in the search input was the last standalone icon that hadn’t yet been integrated into the standard icon sprite. We just made the switch so now the icon is fully themable and includes the HD retina icon version too. To do this, we had to place the icon inside the standard icon disc so the appearance is a bit different, but it now matches the rest of the UI system. Note that we’re adding this though a CSS technique that isn’t supported by IE 6-7 so in those browsers, the icon won’t appear (please don’t file a bug!). We’ve been working on a completely new ThemeRoller tool, built from the ground-up for jQuery Mobile. Tyler Benzinger from Adobe has been spearheading the development effort (thanks Tyler!) and we’re very close for having a beta version ready for release. We’re really excited to show it off because there are a lot of super cool features that make it drop-dead-simple to build a stunning theme in minutes. If you’re going to be at the jQuery Conference in Boston, you’ll get a sneak peek during the mobile keynote with Scott and Todd. Look for a beta version to be launch within the next week or two. Now that we’ve decoupled most of the UI widgets, we’ve set the stage for there to be a download builder. 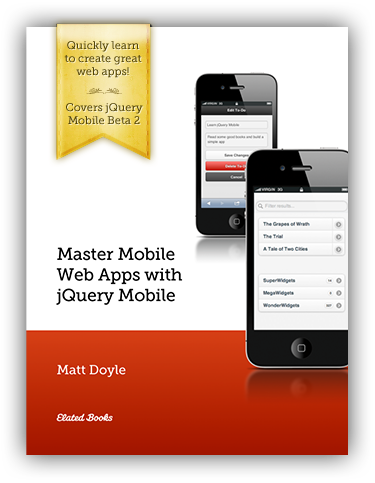 This will let you build a custom version of jQuery Mobile to only include the parts you need. For example, you could just use the core files to add Ajax-based navigation with pushState and leverage some of the touch events and other utilities with a very lightweight build (roughly 10k). Or, you could add in specific UI widgets like form elements, listviews, etc. to create an optimized build. We’re aiming to have a download builder tool launch as part of 1.0 final in some form. We’re working on a dependency map now for all the plugins to support this tool. We’ve been working on adding more traditional API-style documentation for many of our widgets and, with the help of volunteers and Maggie Wachs, we’ve now covered all the form elements: buttons, text inputs, slider, flip switch, radio buttons, checkboxes, and selects in addition to bulking up docs on the touch, virtual mouse and page events. We’ll continue to refine and extend our docs as we head toward 1.0 final. We recently received a slick MeeGo device from Nokia for testing and we were thrilled to find that jQuery Mobile worked beautifully the first time we fired it up. This has to be one of the easiest platform additions we’ve had and it shows how our focus on web standards and feature detection is really paying off. We’re excited to announce that as of 1.0 RC1, we’ve covered all our target platforms for the project. At this stage, we have broad support for the vast majority of all modern desktop, smartphone, tablet, and e-reader platforms. In addition, feature phones and older browsers are supported because of our progressive enhancement approach. We’re very proud of our commitment to universal accessibility through our broad support for all popular platforms. In preparation for jQuery Mobile 1.0 final, we’re removed a number of items that we deprecated earlier in beta. Please note that if you are running on an alpha or early beta codebase, many of these could be breaking changes. 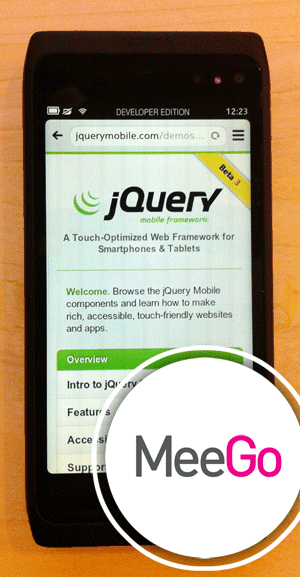 Updated jQuery Mobile to run on jQuery core 1.6.4 to keep up with the latest and greatest. Add new pageremove event (issue 2537) – Modified the pagehide callback in $.mobile._bindPageRemove() so that it fires off a “pageremove” event. Callbacks can prevent the removal of the page by simply calling preventDefault() on the pagremove event object that is passed to their callback. Windows Phone 7 : icon-only buttons aren’t showing up (issue 1230) – Fixed by removing and extranious “text-indent: -9999px” CSS rule set on the buttons themselves, which was causing IE to hide the icons (as they’re inline). Disabled touch overflow scrolling for iOS5 by default– overridable through $.mobile.touchOverflowEnabled to opt iOS5 devices will benefit from the improved animated page transitions and true fixed headers. Once iOS5 lands in it’s final form, we’ll consider whether to enable by default. iOS5 scrolling rendering bugs (issue 2415) – applied a 3D transform gets rid of the element peekaboo issue for headers, and other content in the page not rendering. We’ll need to monitor this to see what the memory impact is before keeping it. Removed the separate search icon image and used the one from the icon sprite. Because of this, we’ll save a request and now have a HD (retina) icon, but the icon is slightly different as a result (it has a disc, making it consistent with other icons in the framework). Transition to the same page (issue 2529) – Added a new allowSamePageTransition option to the changePage() method default settings. By default, we prevent changePage() requests when the fromPage and toPage are the same element, but folks that generate content manually/dynamically and reuse pages want to be able to transition to the same page. To allow this, they will need to change the default value of allowSamePageTransition to true, *OR*, pass it in as an option when they manually call changePage().It should be noted that our default transition animations assume that the formPage and toPage are different elements, so they may behave unexpectedly. It is up to the developer that turns on the allowSamePageTransition option to either turn off transition animations, or make sure that an appropriate animation transition is used. Targeted the workaround for auto-correct for iOS4 and below (issue 785) – jQM text input forces use of iOS auto-correction seems to be fixed on iOS 5 devices. This is still a problem on iOS 4.x and earlier so we’re just targeting the workaround a bit better now. We don’t have a specific test for iOS 5 so we use $.support.touchOverflow as an iOS 5 and later indicator. Added new data-content-theme attribute (issue 1899) – this styles the content of the collapsible data-theme and data-content-theme inherit collapsible-set’s. Part of the larger collapsible design cleanup effort. Collapsible heading vclick issue (issue 2212) – Switch to using “click” instead of “vclick” on collapsible headers since that is the only reliable way to prevent uncaught/mismatched clicks from firing on a different element. Thanks marcing! Navigation regex breaking Firefox >3.6 (issue 1514) – Remove greedy matches from start and end of regex – there’s no need for them, and they cause immense slowdown (on the order of 3-4 seconds on medium-size pages loaded via ajax). Thanks MaxThrax! Restored button inline button styling (issue #2496)- Fixed by defining inline as an option in the button markup plugin. The recent jqmData changes exposed this issue. Default for this option is false. Listview arrow icons not clickable (issue #2516) – Tightened scope of a previous fix for clicks not registering on listview buttons’ icons. Thanks Wilto! User can’t specify own error handling logic (issue #2503) – Added the following notifications to $.mobile.loadPage(): pagebeforeload – Triggered just before loadPage() attempts to dynamically load an external page. Developers can prevent the default loading behavior by calling preventDefault() on the event. If preventDefault() is called, it is up to the developer to call resolve()/reject() on the deferred object passed within the data object (2nd arg to the event callback). pageload– Triggered after an external page has been loaded and inserted into the document. pageloadfailed – Triggered when the load of an external page fails. Developers can prevent the default behavior (error dialog display) by calling preventDefault() on the event. If preventDefault() is called, it is up to the developer to call resolve()/reject() on the deferred object (2nd arg to the event callback). Enable forms to submit to the same page – When a form is submitting via post to a url that already has a page represented in the DOM, replace the current page with the response page of the same url (post params are not passed via q string, so the URLs are identical). Form buttons no longer submit forms in Internet Explorer 8 (issue 1927) – Using “filter” for opacity was causing strange issues in IE, making all but the text on submit inputs click-proof. Prevents “undefined is null or not an object” error in IE, when .scrollTop() was being called before the body was ready. Thanks Wilto! Submit inputs’ values are added to the form as a hidden input — this ensures it will only happen once for jQuery’s serialize, and that this logic only applies to submit inputs with a name attribute. Thanks Wilto! Prevent styling list count bubbles unless list is enhanced. Thanks bjohn465! Flip toggle switch with change event bound, triggers multiple times (issue 2315) – Modified refresh() so that it checks to see if the value actually changed before firing off the “change” event. Native checkboxes and radio buttons partially visible under custom controls (issue #1336) – Fixed by tweaking styles to float native controls rather than being inline, to fix height and properly hide checkboxes/radios. Thanks Wilto! Arrow on formatted listviews no longer clickable (issue 1392) – Positions .ui-icon on lower z-index than .ui-btn-text, ensuring the click will register on the latter. Thanks Wilto! Can’t link to dynamically created data-role=”page” (issue 1243)- Modified loadPage() so that if the data-url lookup for a given page fails, that it look for the page via id (if it is an embedded page URL). This allows us to find dynamically injected pages that are un-enhanced and missing their data-url attributes. Fix for change page flicking in landscape orientation on iPad (issue 2474) – On iOS, giving focus to the ui-page element causes flashing during page animations/transitions. This is due to the CSS outline property which is applied when the page is given focus. Turning outlines off for all pages prevents the flashing. Resolved label vertical alignment inconsistency of form elements (issue 2192). On wider screens or landscape orientation, for text-inputs, radios, sliders and checkboxes the vertical-align is top, for flip-switches and select-lists the vertical-align is baseline in all swatches. Thanks MauriceG! Adjusted timing of when the orientation and resize classes are added to the body because the original mobileinit timing was limiting the ability to dynamically append jQuery Mobile. Thanks @martynsmith! Removed the top “glow” border on icon-only buttons in split button lists (issue 1900). The border-radius was too large for the button which caused it to render as a straight line and break out of the button, removing this cleans up the appearance. Thanks MauriceG! Fix for dialogs not working if $.mobile.ajaxEnabled = false (issue 2451 and 2202) – Modified the default click handler to check if the href is for an embedded page before bailing when ajaxEnabled = false. This allows us to navigate to internal/embedded pages/dialogs on the click versus waiting for the accidental hashchange that was the result of the browser’s default handling of hash fragments. jqmHasData cleanup for jQuery 1.7 (issue 2455)- Changed behavior of .jqmData() only when called with no argument. It now returns undefined. Fix for URL handling and PlayBook Webworks app (issue 2050) – Modified the url parser regexp so that we can find the double slash that precedes the authority. This is necessary so we can reconstruct resource urls used on some devices like Rim’s Playbook that use urls like:location:/dir1/dir2/file.html. Also modified makeAbsoluteUrl() so that it uses the new doubleSlash property in the object returned from parseUrl() instead of assuming that it is ok to use a double slash. Fix for right/middle click issue in Firefox (issue 2438) – In Firefox, right-clicking on a linked-element results in the normal click event being fired instead of allowing the context menu to be displayed. Navigation from one page back to multi-page template (issue 2406) – We now make sure that our hashchange resolves non-path hashes against the documentBase. This prevents the resulting changePath() call from incorrectly resolving against the URL for the current active (external) page. Also fixed a related issue where when push-state is turned on, the hashchange event is not fired when doing a window.history.back() from an external URL to an embedded page. Page removal code for listviews removes embedded pages (issue 2432) – Added a new data attribute tag for pages loaded via ajax to keep track of whether to remove pages in this situation. Fixed select element theme support (issue 2423) – Fixed a regression where directly applying a data theme to a select element no longer themes the select element. It only gets its theme from the parent, regardless of what you tell it. Improved qualifications so that iOS5 gets the old-style fixed headers and footers when touchOverflow is disabled (which is the default). The jQuery Mobile team is now focused on bug-fixing and preparation for our first release candidate (RC1) for 1.0. We’ll be releasing RC1 within a week, just in time for the jQuery conference in early October. From there, we’ll have a few quick RCs with additional bug fixes before releasing 1.0 a bit later in October. Nokia was kind enough to send us a N950 phone for testing recently. Not only is Meego a super slick OS and the 950 an impressive piece of hardware, we were thrilled to find that jQuery Mobile worked beautifully the first time we fired it up. This has to be one of the easiest platform additions we’ve had and it shows how our focus on web standards and feature detection is really paying off. Let’s hope we need more Meego devices in the future, it’s a really nice platform. In preparation for jQuery Mobile 1.0, we’re removed a number of deprecated features. Please note that if you are running on an alpha codebase, many of these will be breaking changes. Enable touch overflow scrolling on by default where supported – The $.mobile.touchOverflowEnabled is now true by default meaning that iOS5 devices will benefit from the improved animated page transitions and true fixed headers by default. Can’t link to dynamically created data-role=”page” (issue 1243) – Modified loadPage() so that if the data-url lookup for a given page fails, that it look for the page via id (if it is an embedded page URL). This allows us to find dynamically injected pages that are un-enhanced and missing their data-url attributes. 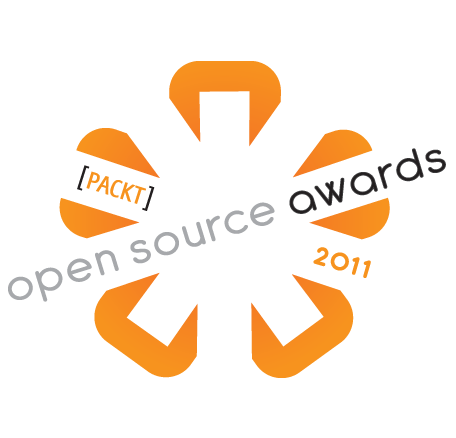 We’re honored to be nominated for Packt Publishing’s Open Source Awards in the “Mobile Toolkits and Libraries” category. The Voting stage begins on 19th September 2011 and closes on 31st October 2011, with the winners announced throughout the week commencing 7th November 2011. Vote now for jQuery Mobile! Since starting to work with Jquery Mobile I have been looking for a more “app-like” navigation bar. There are examples abound, but most can be used on webkit-browsers only. Since I did not find a real cross-browser solution, I made one myself. I call it the bartender plugin.